I've never really been a spiritually religious person. I enjoy the culture of my religion and the time spent with my family and friends on the holidays. I like the foods that we eat and some of the season's rituals. My family hasn't always been the closest, but you would never know that if you were a fly on the wall during the holidays. Yet in reading about Kwanzaa, I discovered that connection is really what the week-long festival is all about. It began as a celebration of family and unity. Kwanzaa is celebrated daily from December 26th to January 1st, with each day representing a specific ideal one should work on. These principles include Unity, Self-Determination, Collective Work & Responsibility, Cooperative Economics, Purpose, Creativity and Faith. You don't need to be African-American to celebrate Kwanzaa. There are many aspects of African culture that are enjoyed by all Americans, whether it be the music, cuisine, arts, or so much more. I'm not saying I'm going to celebrate Kwanzaa this year, but I may just put on some Fela Kuti while I'm doing my own holiday cooking and remember what others are doing to celebrate their culture. 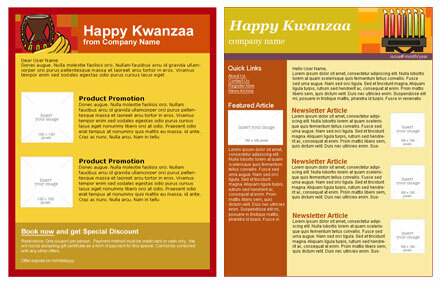 This holiday season, perhaps you can use a Benchmark Kwanzaa email template and share with your list some of your own culture that you enjoy during your holiday celebrations. Bring everyone a little closer together.